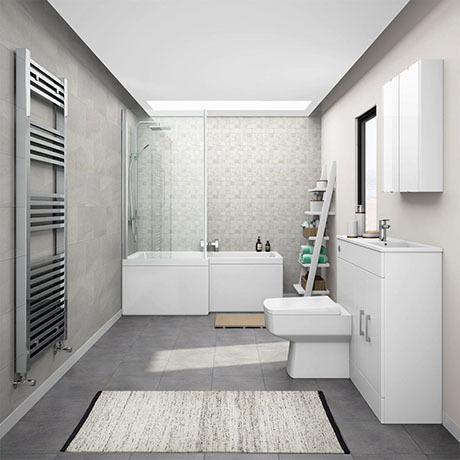 The sleek slimline white gloss Cello small bathroom suite, features a contemporary streamlined look with beautiful clean lines providing your bathroom with the ultimate space saving solution, features a modern shower bath which allows showering and bathing space in the bathroom. Ideal for renewing the style in any bathroom where space is limited. Features a fresh white gloss finish, modern chrome effect handles and a slim poly-marble basin with worktop. The 1500mm Shower bath comes with a hinged glass bath screen and matching front panel manufactured from high quality gloss white acrylic. Reversible slim basin top for left or right hand tap positions. Ideal for smaller bathrooms & cloakrooms.